The Rotoform HS (High Speed) granulator builds on the same basic principle as the standard 4G models but features a much larger rotating shell that enables significantly higher capacity production. This high performance Rotoform system is ideal for products with a short cooling time and low viscosity, like sulphur, Bisphenol A, caprolactam, MA (Maleic Anhydride) and naphthalene, as well as a wide range of fertilizer products including urea. The main difference between the Rotoform HS and the base model Rotoform 4G is the much larger diameter of the rotating outer shell that actually deposits the molten product onto the steel belt. This means the influence of centrifugal force on the drop shape is reduced. The system can be operated at a higher speed while maintaining control of end product quality – still delivering a consistent pastille with a regular, hemispherical shape. The engineering that goes into producing a dropforming device with much bigger diameter and 30,000+ accurately positioned holes is impressive enough. 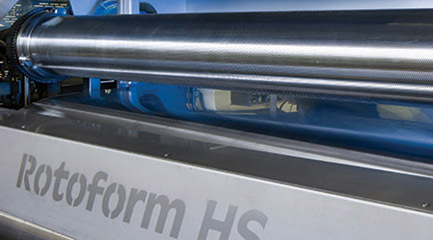 The Rotoform HS is suitable for use with low and medium viscosity, fast cooling (< 20 seconds) products. As product cooling times are unaffected by the process itself, a system running at twice the speed needs twice the cooling length (up to 120 metres).